From 6 to 17 November, UN Member States gathered in Bonn to advance the implementation of the Paris Agreement in terms of transparency, adaptation, emission reductions, finance, capacity-building and technology. As at previous editions of the COP, UCLG sent a strong delegation of around 60 local and regional leaders to advocate for the role of local and territorial action in combatting climate change. The highlight of the conference for our constituency was the Climate Summit of Local and Regional Leaders, organized by ICLEI with the support of the Global Taskforce of Local and Regional Governments. 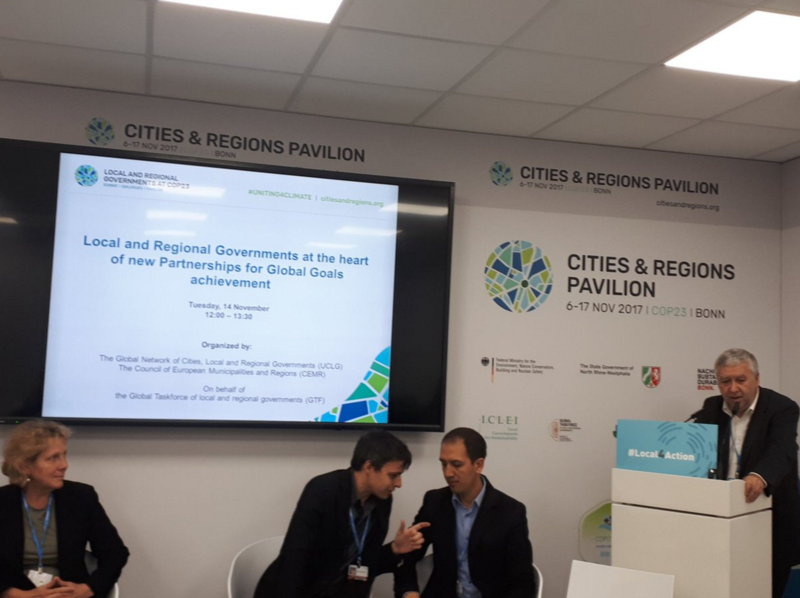 UCLG Co-President and Mayor of Strasbourg, Roland Ries, argued that “one of the most important roles we can play, as local leaders, is to involve our citizens in the climate agenda.” Ries also highlighted the importance of deeper collaboration with national governments in the fight against climate change. For her part, UCLG Vice-President and Mayor of Rosario, Monica Fein, highlighted the difficulties faced by cities in Latin America in accessing climate funding. 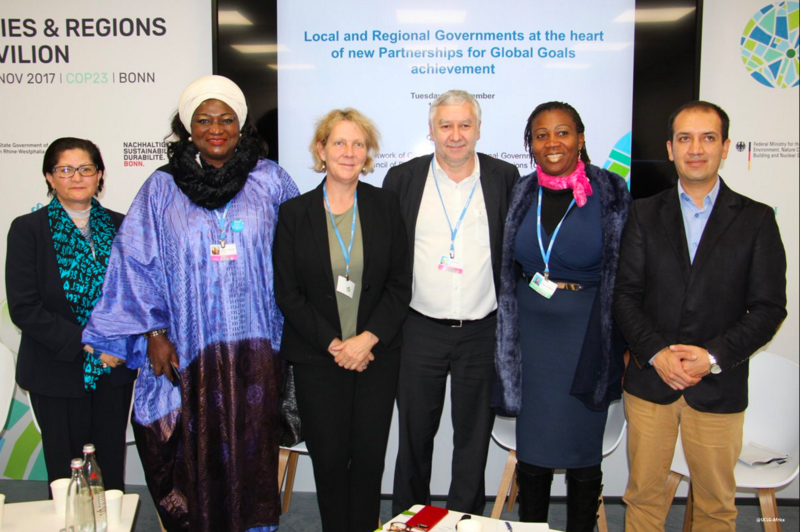 The local and regional government constituency and our partners led the organization of Human Settlement Day at COP 23. This thematic day aimed to make recommendations for climate change mitigation and adaptation; highlight progress and promising initiatives; outline how human settlements can contribute to implementing the Paris Agreement and promote commitments from different sectors. Human Settlement Day symbolized the recognition of the importance of territorial action and the commitment of local actors to achieve the goals of the Paris Agreement. The day gathered local actors to share their experiences of​ innovative solutions and ways of supporting low-carbon consumption and production patterns, resource-efficient and resilient construction practices, as well as creative people-centered financial mechanisms. Delivering concluding remarks of the opening session of the day, organized by UCLG on behalf of the Global Taskforce, Deputy Mayor of Barcelona for Ecology, Urban Planning and Mobility, Janet Sanz, pointed out that “sustainability is closely linked to the Right to the City: the right to create the city and empower citizenship. The Right to the City entails key principles for our work, such as the right to housing, the right to clean air and the right to health." This event aimed to show how the engagement of human settlement stakeholders has shifted into an implementation phase since the adoption of the Paris Agreement and SDG 11 on Cities and Human Settlements. The local and regional government constituency co-organized the opening plenary session of the High Level Roundtable on SDG11, “Women leaders on making human settlements inclusive, sustainable and resilient”, which bought together a unique group of women mayors, governors, ministers and civil society leaders, who are driving forces to accelerate the transition to sustainable and resilient cities for all. 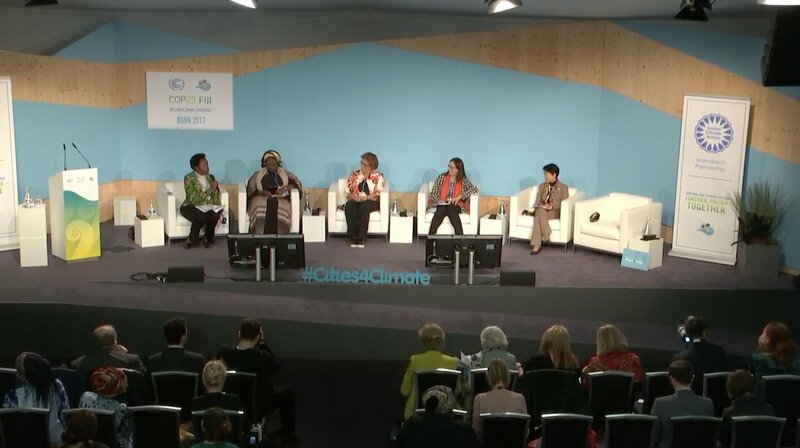 A video of the full Roundtable, with contributions from Mayor of Malmö, Sweden, Katrin Stjernfeldt Jammeh; Mayor of Bangangté, Cameroon and REFELA President, Célestine Ketcha Courtès; Mayor of Caracas, Venezuela, Helen Fernández; Mayor of Mandlakazi, Mozambique, Maria Helena Langa and Governor of Oregon, USA, Kate Brown is available here. This side event was organized by UCLG and CEMR on behalf of the Global Taskforce to explore synergies between the different global agendas and bring local and regional governments and their partners together to share experiences and recommendations. The session was moderated by Councilor of Nantes Municipality, France and UCLG Spokesperson, Ronan Dantec. 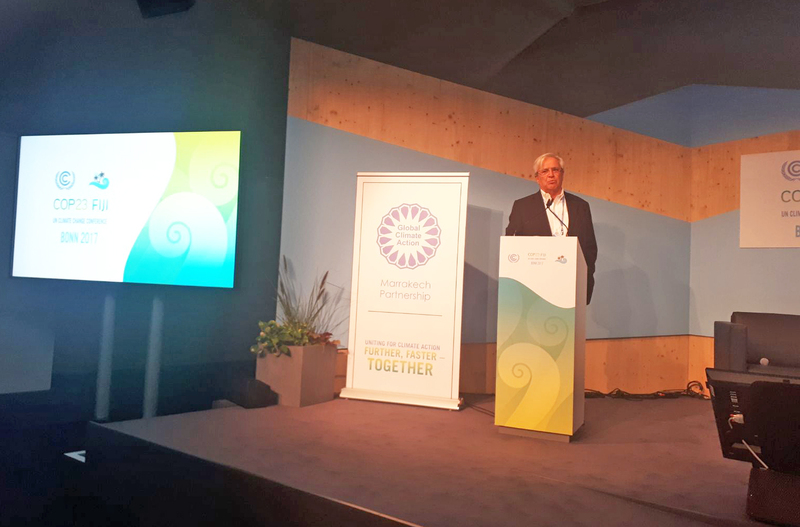 He emphasized the importance of increased recognition of the need to involve all stakeholders if we want to reach climate agreements and ensure a sustainable future. Dantec also recalled the role of organisations such as Climate Chance, which brings all stakeholders together once a year to work on joint messages towards the COP. 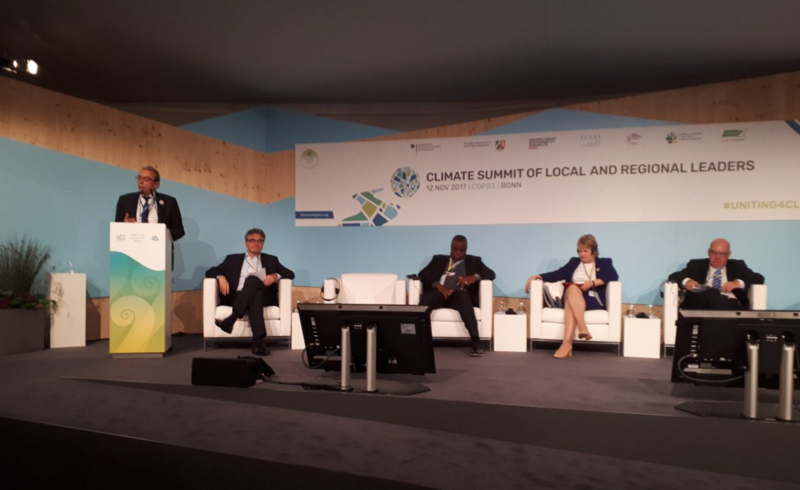 Mayor of Bangangté, Cameroon and REFELA President, Célestine Ketcha Courtès, recalled the importance of working with local people to ensure the relevance and success of climate actions. Director of environmental management of CONGOPE, a Consortium of Provincial Governments, Henry Guzmán, shared the collaborative work done between regions and national ministries in Ecuador on climate change action, enabling accurate plans at both local and national levels. Director of UCLG Africa’s Academy for Local Governments of Africa, Najat Zarrouk, presented the vision and work of the academy in contributing to capacity building of local political and technical staff. Professor at Canberra University, Barbara Norman, launched “Canberra Urban & Regional Futures” (CURF), an international academic network for climate change and sustainability research.